From among my habits of work at the bandsaw, here are some that you may find handy. 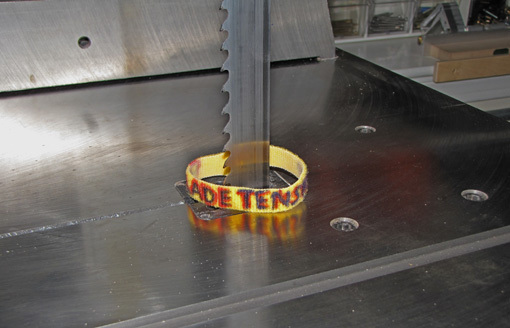 1- The yellow velcro band placed around the blade is a reminder to tension the blade before work. Starting up the saw with a loose blade is not a happy moment (yes, of course, I’ve made that mistake) but it could be particularly damaging to a carbide-tipped blade. The velcro is placed aside during work so replacing it when the work is done is a reminder to release the blade tension. 2- Much has been written about proper blade tension, but like all tool adjustments, the goal is good performance. The same blade used to saw 8/4 stock will very likely need more tension when it is used for a 10″ resaw. Whether cambering a plane iron, choosing a bevel angle for a chisel, or tensioning a bandsaw blade, it always pays to “close the loop” by using feedback from the tool’s performance to confirm or modify the adjustments. Wood density, blade cleanliness, and heat build-up are just a few of the variables that make it unwise to tension the blade without thought. 3- After installing and tracking a blade and before going to work with it, it’s a good idea to close the doors on the saw, run it for just a few seconds, wait until it stops completely, and then open the doors to check the position of the blade on the wheels and make sure all is OK.
4- It is easier to follow a layout line when it is viewed with both eyes (binocularly). Sometimes the blade guard or the guide bearing assembly will block one eye’s view of the line, depending on where you position your head. 5- When bandsawing freehand, I always think, “Feed the line to the blade teeth.” This is just the opposite of handsawing and I often have to remind myself to maintain the correct mentality at the bandsaw after I’ve been sawing by hand. 6- The push stick (below) has a rare-earth magnet which allows it to be stored within easy reach on the saw’s frame. The hole is a reminder of which end has the magnet. 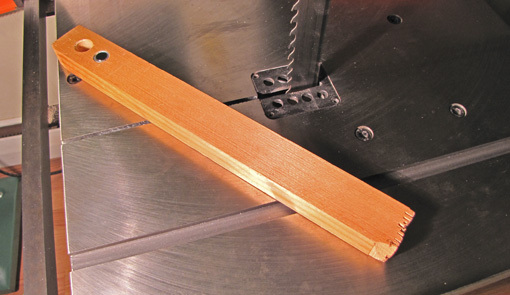 The short saw kerfs at the front end of the stick, which accumulate as it is used, can grip the corner of the wood as the cut nears completion. The stick has a limited life, of course, so the magnet is in a removable cup. 7- Large sawdust particles inevitably accumulate on the lower tire despite the actions of the wheel brush and the wood plate below the lower bearing assembly. A paint scraper held lightly against the tire as the wheel is spun by hand quickly removes the debris. A “synthetic steel wool” pad such as Scotch-Brite can also be used. 8- The variable-pitch, carbide-tip blade from Suffolk Machinery is a big help in resawing. It also is great for preparing leg stock and any other straight sawing of thick stock. 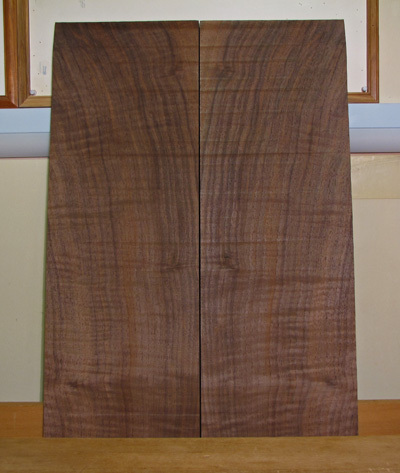 Below is a 10 1/2″ wide Claro walnut board from Northwest Timber which I resawed with this blade. One of the many reasons why the bandsaw is so endearing. I hope some of these tips prove useful in your shop. Good tips for the bandsaw–I hadn’t thought of the yellow band. I’ll start using it! Also read through your older bandsaw posts and wanted to note that you articulated my own rationale very well. I took Krenov’s advice and “over-bought” on my first saw, a Agazzani b-18 almost three years ago. The only niggling regret I’ve had is that I didn’t buy the b-20 (but the difference in price paid for my dewalt planer and there’s no real difference in performance between the 18 and 20). Since then, there seems to have been an explosion of frame bandsaws, but if I had it to do over, I’d buy the same one or maybe a Hammer because the source (Italy) and service (Eagle Tool) were and important to me. I also have a 1″ carbide blade and it’s simply amazing… The biggest reason i’ve been happy with the machine is that I never have to fight it. Thanks for the good reading and lovely photos!